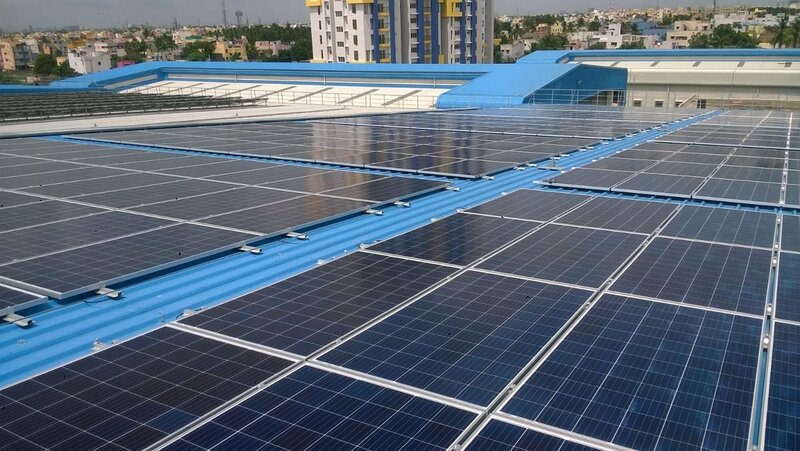 “We have successfully installed and commissioned 1,120 kWp solar power plant on the roofs of Alandur and St. Thomas Mount Metro stations and on the ground level at Metro Rail Depot, Koyambedu. This project is expected to generate around 1,51,200 units per month, saving around ₹69 lakh per year,” said CMRL spokesperson. The CMRL is executing this project under the Zero Capital Investment (ZCI) and is based on the RESCO Model under Solar Energy Corporation of India (SECI) scheme, on a monthly tariff based payment. Now, the installed capacity of rooftop solar panels by CMRL has a capacity of 3 MW in total. Another 4.6 MW rooftop solar panel installation is under progress and expected to be completed by end of this year. Recently, the CMRL has appointed a consultancy firm for initiating processes to procure electricity from various renewable energy sources like solar, wind, etc., at competitive prices through open access, saving ₹ 1 crore anually. In October, the CMRL commissioned another 410 kWp solar panel plant on the roof and ground of Metro Rail Depot, Koyambedu. This plant is currently generating around 55,350 units per month saving around ₹14.5 lakh per year. The Rs 20,000-crore Chennai Metro Rail project has been ridden with technical glitches, internal problems, and incomplete works in underground and elevated stretches.The underground stretch, which was inaugurated in May 2017, has often been plagued by the train stopping in between, and commuters facing a harrowing time. Even the construction has been questioned after a roof slate of Shenoy Nagar Metro station fell on a passenger a couple of months ago. On Friday, Chennai Metro was criticised, again, when a passenger took a picture of a leaking roof on the second platform of Anna Nagar Tower station which was inaugurated this year. “Water was leaking from the a/c duct, but we have changed to a new duct. Only the board needs to be replaced,” said an official. It is reported to be repaired in a couple of days by the station controller. However, this is not the only incident in the Metro. Sources say that many incidents have not been reported. “There was a fire at night at Pachayappas College station. It was hushed up and rectified,” the source alleged. Meanwhile, most of the works on the Metro are yet to be completed. Sources say that works are still pending in both elevated and underground stations and many a time, these pose a threat to passengers. There have also been train disruptions. The trains have suffered a breakdown more than seven times. While officials dismiss it as technical glitches, sources inside Metro Rail blame the lack of skilled and trained employees being used to run the trains. “They have been outsourcing manpower from MEMCO. The previous managing director was particular that only housekeeping and ticketing should be outsourced. Now, Chennai Metro is outsourcing drivers and plans are to have station controllers also,” a source said. Prior to outsourcing, the employees of Metro Rail had to undergo training at New Delhi Metro Rail Corporation and after that, one-year skill-based training at Chennai Metro after which they were pressed into service. “Now everything is outsourced mostly to Bengaluru-based companies,” said another source. Meanwhile, there are internal issues including employees seeking pay rise on par with executives and as per Third Pay Revision Commission. The employees, mostly technicians, junior engineers, and station controllers, allege that the pay rise is not on par with the executives who got nearly 20 percent pay rise. The employees also claim that Chennai Metro is the only one to have two shifts at most of the stations instead of three. Chennai Metro has said that the demands of employees are unacceptable. “The junior engineer and technicians are already paid `39,000 and `23,000 respectively, which is high as per industry standards when taken into account the pay scale in government organizations and private establishments,” said a Metro Rail official.